I'm slowly recurring from the summer break. It was a nice break although the weather here in Switzerland is terrible. Rain, rain and again rain. There are flooded villages and a lot of damage all over the country. My thoughts are with the people who are affected. The Diva's Weekly Challenge #178: The Challenge was to create a Duotangle with Tangles beginning with the initials of your name. 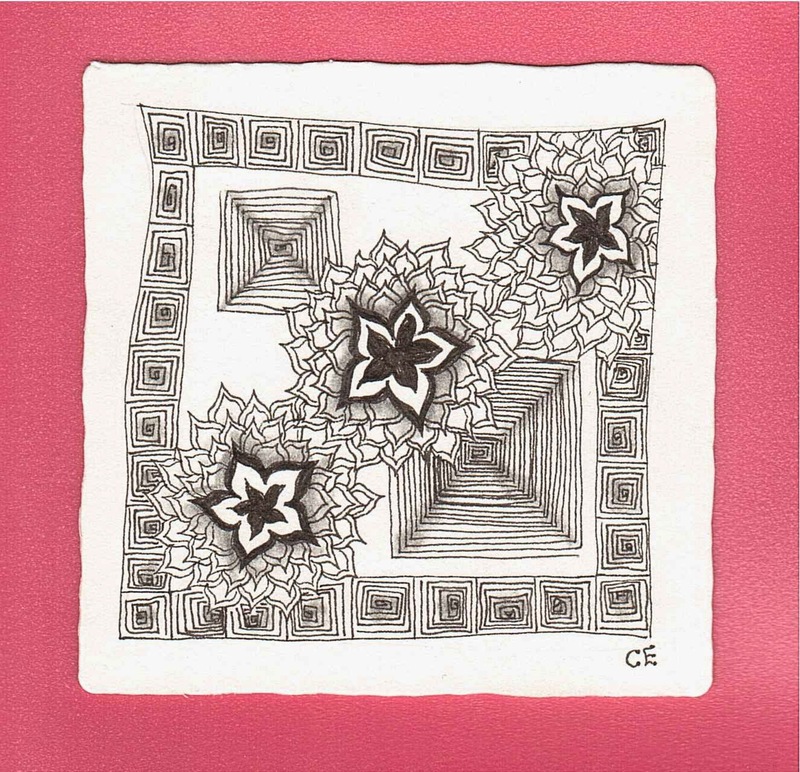 So I chose two Tangles, Cyme and Emingle, created by Maria and Rick of Zentangle, in honour of the 10th birthday of Zentangle. I think you did so very well. I love the way you framed it and left some open space in it. Let's hope the weather will get better, here in Holland it's also very, very wet and humid. Wunderschön und so feine Linien! Mir gefällt auch das dunkle Zentrum von Cyme ... ergibt einen so schönen Kontrast! Einfach wunderbar! Das Wetter, besonders der Starkregen, macht uns auch hier zu schaffen ... aber heute ist es sehr schön! Beautiful tile and great choice of tangles. Very nice. I hope the weather improves soon. Nice job on Cyme. I have not used it a lot probably because it is one that gives me a little trouble. You did well with it. Your tile reminds me of a tapestry.